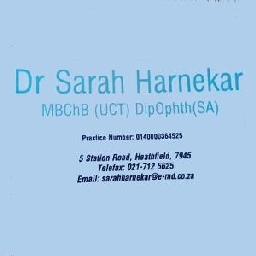 Dr Sarah Harnekar is a hardworking General Practitioner, she has been based at her General Medical Practice in Heathfield since 2010. With her wealth of knowledge and experience she tends to the Healthcare needs of the families of Heathfield and surrounding areas. Accept all Medical Aids except Carecross Plan. I have been with Dr Harnekar since the birth of my first daughter who is turning 4. She is part of the family. My kids love her, she's very engaging, asks the right questions and always makes you feel comfortable. My family and I have been with Dr since she opened. My daughters absolutely adore her. She is brilliant with kids and has an amazing bedside manner. A really good doctor and person, very easy to talk to. Great bedside manner and the receptionist Ilhaam is also very welcoming. She is simply the best GP. I recommend my family to her all the time. I don't know what else to say...she is amazing. Good doctor. I've been going to her for years. She is so good with kids as well. She is located so close to my house and never a long wait. Very professional and knowledgeable. An excellent doctor who truly shows that she cares about her patients. I've been going to Dr Sarah for almost 7 years and I really like how easy and open she is to speak to about any issue. Dr Harnekar treated my son with patience, care and professionalism. I was very impressed. Dr Harnekar is hands-down one of the best General Practitioners I have ever been to. Great Doctor! For the one of the few times ever, I can say I felt like a doctor was genuinely interested in listening to me and trying to solve my problems! This doctor was recommended by my friends. Thanks to them I've known this wonderful doctor. I've always been very happy with the professional service provided by Dr Sarah. She is a great family doctor. I have known Dr since my daughter was 4 and never changed doctors she is amazing, humble and a great person. The Dr is patient, understanding and excellent service both Dr and receptionist. Both very friendly. Dr Harnekar is commended for her thorough yet swift manner in which she deals with her patients. She has been our family doctor since 2013 and we're very happy with the service we receive! Never had a feeling I needed a second opinion. Will refer to a specialist only if really required to do so. This is the best doctor that we have ever had!! !patient..humble...dedicated and is always willing to go the extra mile. Dr Sarah Harnekar is the best and I highly recommend her. she gives her full attention with love and care and always has a solution for a problem. Humble and down to earth with a caring disposition and empathetic approach. In my opinion, she is a diamond among gemstones and I have nothing but gratitude for her work ethic. She is awesome! Always thorough and attentive. Healing hands that compliment her skill. Dr Harnekar is a valuable asset to our community! I refuse to go to any other doctor, she is the best by far, always helpful and extremely gentle.